Alyssa Howes faced a mountain of obstacles before reaching first grade at Prisk Elementary School. Leukemia. Chemotherapy. Radiation treatment. A virus that affected her brain. She lost her eyesight and became handicapped on her right side, including her arm and leg. But today she is back in class at Prisk with a special sidekick to help navigate the school day. That friend is Flint, a golden retriever trained to detect seizures, which Alyssa began experiencing about three years ago. Both Alyssa and her companion are miracles of sorts. Alyssa’s doctors say she’s “out of the box,” and they don’t have clear answers at times, but they are excited with her progress, and amazed at her strength to keep going. Flint can alert humans of oncoming seizures before they occur. This allows the person time to take seizure-blocking medication, get to a safe place or call for assistance. How dogs detect an oncoming seizure in a human is a mystery. Some trainers and researchers think they detect subtle changes in human behavior or scent before an episode happens. Flint joined Alyssa at school last week, providing teachable moments for classmates. Flint visited classrooms during the first week so that he could be introduced to all the students. Teachers read aloud books about service dogs and the many different jobs they perform. Flint was still adjusting to the attention, and he seemed tired by day’s end. But Alyssa has become accustomed to her canine companion, saying her favorite part of having a service dog is playing with him. With Flint by her side, the determined first grader is planning her future. She wants to be a veterinarian. 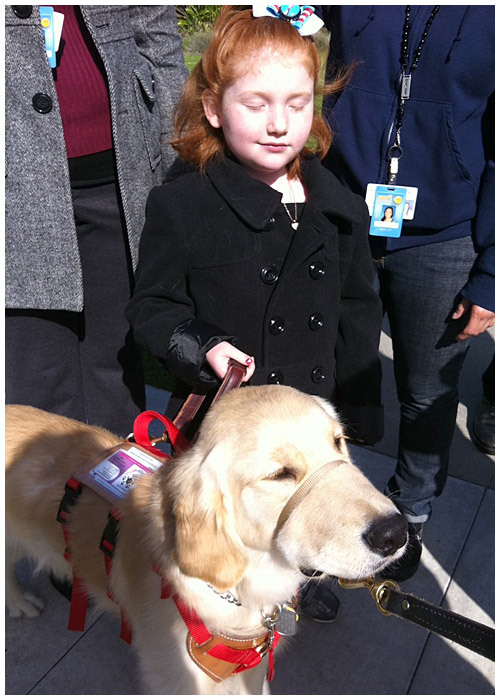 CANINE COMPANION—Flint, a golden retriever, helps Prisk Elementary School first grader Alyssa Howes at school.